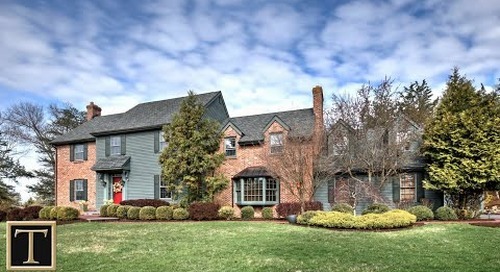 For more information: goo.gl/A43sBj This immaculate custom Colonial is located on a pastoral road in Mendham Township. Sited on approximately 5.43 tranquil acres, the brick front residence is set amidst mature hardwood and specimen trees, perennial gardens and lush green lawns. Buttermilk Falls Natural Area is adjacent to the property, where the swimming hole has been a longtime favorite for generations. Built in 2002 by award-winning Fenix Investment & Development, the home has experienced several updates and renovations over the years. Today, this extraordinary home offers gracious interior and exterior spaces enhanced by timeless appeal. The 11-room residence features five bedrooms, four full baths and two powder rooms; there are two gas fireplaces and one-wood burning fireplace. A layout of over 5,900 square-feet spans two finished levels in an easy flowing floor plan. There is also a three-car attached garage and a full basement with high ceilings ready to be finished. The current owners recently created a resort-style backyard which includes a 65-foot heated saltwater swimming pool with spa and slide, expansive paver patio, stone walkways and multi-leveled retaining walls. 55 tandem trucks brought in soil to create the level yard. Other highlights of this stunning space include a two-tiered Brazilian mahogany Ipé deck, covered porch and gas fire pit, all surrounded by colorful perennial gardens. Entered by a bright, sun lit two-story foyer, notable details include handsome hardwood flooring, extensive millwork and a dramatic candelabra chandelier. The foyer opens to the living room which features hardwood flooring with walnut inlay, shadow box wall molding and crown molding with cove lighting. A gas fireplace with marble surround and wood mantle is a centerpiece and French doors open into a bright hallway featuring a Palladian window seat alcove and custom built-in shelving. The dining room, located on the other side of the entry foyer, is similarly appointed with hardwood flooring featuring walnut inlays, elegant crown molding, shadow box wall molding, an intricate ceiling medallion and candelabra chandelier. The well-appointed gourmet kitchen adjoins the dining room; highlights include new travertine flooring and backsplash, a center island with breakfast bar topped in granite, a prep sink and stainless steel microwave and dishwasher. Custom cherry cabinetry and high-end appliances include a Viking six-burner cooktop, Viking double wall ovens, Sub-Zero refrigerator and the second Bosch dishwasher. The breakfast area provides additional seating in front of double glass doors leading to the Ipé deck. The kitchen adjoins a generously-sized family room which presents a wood-burning fireplace with custom wood molding and marble surround. The family room accesses a main hallway through a graceful pillared archway. Down the hallway, a spacious office/study with floor-to-ceiling windows overlooks the spectacular pool area. A mud room with built-in seating, a rear staircase and two powder rooms complete the first floor. The main staircase leads to a palatial master bedroom suite comprised of a master bedroom, sitting room, master bath and two walk-in fitted closets. A focal point of the master bedroom is a gas fireplace with custom wood mantle and marble surround. Overhead, a tray ceiling with recessed lighting adds architectural interest. The sitting room, located across from the master bathroom, also has a tray ceiling and recessed lighting. The spa-like master bathroom is appointed with marble flooring , two custom wood vanities with marble countertops, a chandelier, freestanding soaking tub and seamless glass door shower with tiled bench and full ceramic tile surround. Four more bedrooms are found on this floor, two of which have en suite bathrooms. A bathroom with large double vanity and tub/shower connects the remaining two bedrooms. Completing the second floor is a laundry room fitted with custom cabinetry. Downstairs, the lower level has high ceilings for future finishing, rough-in plumbing for a future bath, and expansive unfinished storage space. This part of the home is reached from the entry foyer and garage. Mendham Township, located in Morris County, is home to award-winning schools, numerous parks, Schiff Nature Preserve and a quaint downtown. Neighborhood playing fields, summer concerts, July 4th and Labor Day parades all add to the hometown appeal of this community. The Township is also close to vibrant downtown Morristown for Midtown Direct train service to New York City as well as Interstates 78, 80 and 287. Newark Liberty International Airport is easily accessible.